The history of this community in the township of Madawaska Valley starts out with the Algonquin, who named it “Kuaenash Ne-ishing”, which means “beautiful bay”. 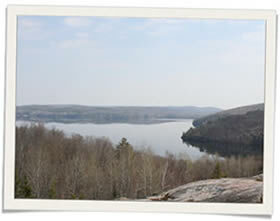 Long before the first pioneers ever laid eyes on this bay on Kamaniskeg Lake, it was a meeting place for bands of aboriginals, who enjoyed the fruits and beauty of the unspoilt nature. Then the wealth of the surrounding forests attracted the lumber dealers. James Barry, who worked as foreman for McLaughlin’s Lumber in Arnprior, built a cabin on the shores of Kamaniskeg Lake. Soon it was the centre of an active lumbermen camp and a lumber depot. Hence it became the company’s headquarters. Everyone called it “Barry’s camp on the bay,” hence “Barry’s Bay”. Yet this was not the only lumber depot that the McLaughlin brothers operated. They became millionaires through the lumber trade. To encourage further settlement of the region, the government initiated the building of “settlement roads”. They were named Addington, Hastings, Opeongo and Ottawa. In 1860 the first settlers arrived from Ireland and Poland to build these roads. Two miles southwest of Barry’s Bay, at the intersection of Siberia and Kartney Roads in an old cemetery one can still find gravestones of these first Polish settlers. In 1896 a small wooden church was built that served the Polish parishioners for nineteen years, until it burnt down in 1914. In its place a monument was erected in 1996. It commemorates the pioneers who are buried in the cemetery. The influence of the Polish immigrants is still evident today. Barry’s Bay is a centre of Kashubian culture in Canada. Kashubians are a West-Slavic ethnic group from north-central Poland. Also, there is a Karol Wojtyla Square in Barry’s Bay. The Our Lady Seat of Wisdom Academy, a Catholic liberal arts post-secondary institution, established in 2000, is located there. Karol Wojtyla became popular as Pope John Paul II (papacy from 1978 – 2005); his native country was Poland. The Opeongo railway line was completed in 1863-64. The historic former railway station still stands and is now a tourist information office. In 1879 the first hotel was built by James Drohan. It was located on the corner of what are now Highway 60 and 62. It was later renamed Blueberry Hotel and then Windsor Hotel. It was a much frequented stopping place on the Opeongo Road. Its stables were located on the very spot where the Bank of Montreal now stands. 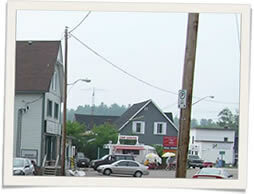 In 1893 the first general store opened in Barry’s Bay. The village of Barry’s Bay was incorporated in 1933, consisting of 520 acres of the Township of Sherwood. Henry J. Chapeskie was its first reeve. In World War II many local workers and lumbermen became soldiers to support Canada’s war efforts. In 1961 the village fathers decided that Barry’s Bay should have its own coat-of-arms. Frank J. Ritza created it, and it was registered in December of the same year. The Polish settlers are represented by the white eagle, the Irish settlers by the harp. The rising sun symbolizes a bright future for immigrants of all nationalities and their descendants in the village of Barry’s Bay. At present the community has a population of about 1,300 people. A few corrections: The small mission church built in 1896, stood empty after 1914 until it burned on August 4, 1940. The Ottawa, Arnprior & Parry Sound railway line reached Barry’s Bay in 1894.